IN JOSEPH MILLAR'S new book, Overtime (Eastern Washington University Press, $14.95 paper), the grease of the auto mechanic and the sweat of the telephone repair man practically rub off the page. You can almost smell the beef stew drifting across the ragged yard. These are poems of pickup trucks and broken-down fishing boats, populated by the hitchhiker standing alone by the wheat field, the children's mother being dropped off at the detox center and the corner grocer who slides the booze into the narrow bag "like a man loading artillery." You don't need a lit degree to dig Millar's poems--and that's his point. "I think poetry in this country has to a certain extent been co-opted by the academy, by the university and [the] English departments, so when you talk about poetry most people think it is kind of effete and complicated," he says. "I am on a campaign against that." Millar does have some lit credentials--he earned an M.A. in poetry from Johns Hopkins in 1970--but his stark, beautiful poems demonstrate that he's also learned from the school of hard knocks. "I'd say the message of the poems is that the best thing we can do is keep going. Sometimes that's all we can do," he says. Shortly after completing graduate school, Millar went up to Alaska in search of adventure and began working on a fishing boat. He immersed himself in the blue-collar world for the next 25 years as he raised a family. About 10 years ago, his interest in poetry sparked again, and he began writing narrative poems about his life. The work slowly grew into a book. 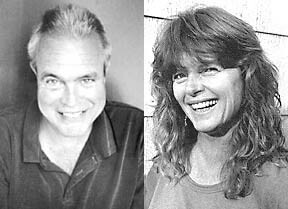 Along the way, he married acclaimed poet Dorianne Laux, who reads with him at Bookshop Santa Cruz Tuesday to celebrate the release of Overtime. Inspired by poets like Philip Levine and Sharon Olds, Millar says he strives to bring poetry to the realm that the average person can connect with. Now a 57-year-old community college professor in Western Oregon, Millar speaks for the construction worker, the commercial fisherman, the single father--all roles he has known firsthand. "Poetry should be about feeling," he says. "If it doesn't make you feel anything, I don't care how clever or well worded it is, or what verbal gymnastics and fireworks the writer is able to show." Though the Bookshop Santa Cruz event will focus on Overtime, many readers may be more familiar with the work of Laux, an accomplished poet with four books to her credit. "She is one of the best readers of poems in the U.S. currently," event organizer Len Anderson of Poetry Santa Cruz raves about Laux. "The delivery of her poems is so powerful you are carried by it." Millar met Laux about 15 years ago when he signed up for a poetry class she was teaching at a bookstore. But they try to keep the competition to a minimum. "I split the readings 50-50 with her," says Millar. "She's hella good, of course. But I am, too ... not to brag." The event is being organized by Poetry Santa Cruz, a nonprofit organization whose founders--members of National Writers Union Local 7--have been holding poetry readings in Santa Cruz for 17 years. The organization, supported with grants from the Cultural Council of Santa Cruz County, the Santa Cruz City Arts Commission and others, has grown to put on poetry workshops and feature monthly readings that bring in poets from around the country as well as locally. Anderson says that although poetry has largely become a neglected art, the voices of poets like Millar and Laux offer audiences an important gift. "Both of these poets have an original and fresh perception of their very own which they have cultivated," he says. "Real poetry provides people with the direct expression of people who feel strongly and think for themselves, and that is what we need to feel strongly ourselves and not become zombies in the mass culture." From the June 19-26, 2002 issue of Metro Santa Cruz.